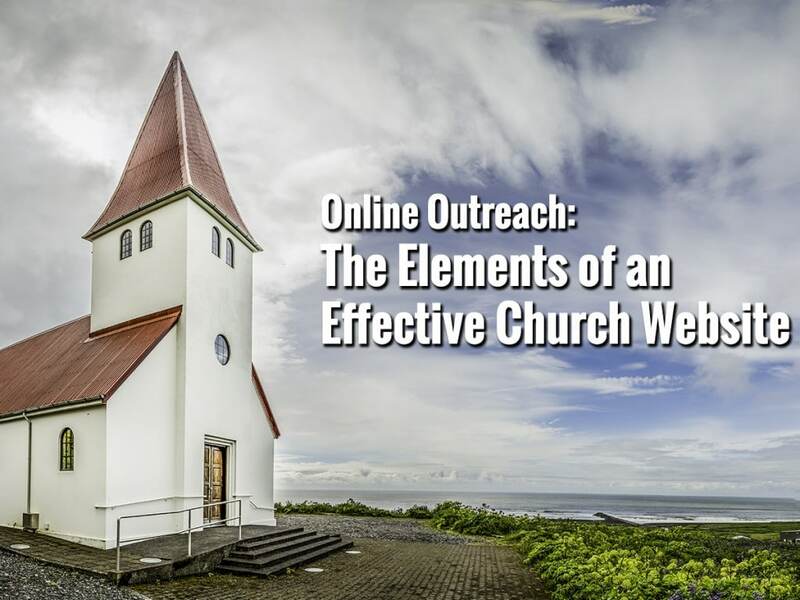 Like most of today’s businesses and organizations, churches and religious centers need an effective, attractive, interactive website in order to not only maintain an online presence within their community, but also to reach potential new congregants. Here’s a look at some simple and easily-implemented website tips to help your church reach more people and build a better ministry. The most important information for your church should be available in plain view. This is good information for any organization’s website, as many companies tend to add new and pertinent information to the bottom of their landing and home pages, creating long and often confusing pages that can turn off new visitors within seconds of clicking. The average visitor will not scroll down a page to get to know more about your ministry—especially if it’s their first or second visit to your page. There really is something to be said about the “one chance to make a first impression” adage, so make sure you put your best foot forward. Keep in mind that a visitor will most likely make up their mind about you almost as soon as the page finishes loading. Put your key information close to the top of the page. Far too many church websites forget the most important aspect of ministry: outreach. Of course, current members of your congregation will come to your website in search of information, and that should be presented in a clear and concise way. But to neglect to make your web portal welcoming—and even targeted towards—those who have never heard of you or visited you in person is tantamount to boarding your church’s windows and turning your lights off. Strive for a warm, welcoming tool (not a brochure or catalog of ideologies) and you’re likely to end up with the kind of website that draws people in and piques curiosity and interest. Think of your landing pages (especially your homepage) as the entry hall to your church building itself. Filling it with messy clutter and distracting information is not only off-putting and uninviting, it may very well deter people from stepping all the way inside and hearing the message you have waiting for them inside. Whenever possible in the design of your website, keep things simple and informative. Use bullet points, subheadings, visual aids, blog posts, and key content in a way that keeps your site easy to navigate and user-friendly. We live in a constantly changing and evolving world. People refresh their newsfeeds, Twitter streams, and Facebook pages every few minutes. That doesn’t mean that your church website needs to change every minute of every day, but it does mean that you need to keep your content fresh and up to date if you want to keep people interested. Update your site with news, information, blog posts, community updates, sermons, and quality content as often as possible. One of the most basic elements to a successful and informative church website is also the very first: its domain name. Choose a name that’s easy to remember, not too long, and not easily confused. Also, make sure you look at it from different perspectives so you don’t end up with an accidental domain name blunder that can cause embarrassment down the road. It seems like a no brainer, but whenever possible you’ll want to stick with a clean, streamlined, professionally designed layout for your website. Forget what you may have heard about needing to spend exorbitant amounts of cash in order to have a decent looking website. Today, you can find professional church website design services that will build a website from the ground up—or even provide you with a sleek and simple template where all you have to do is fill in the blanks with pertinent information. The simple truth is, despite the golden rule of not judging a book by its cover—we are all more attracted to bright, fun, intricate book covers than we are to plain brown paper jackets. You have, on average, just under 3 seconds to capture a web visitor’s attention. You won’t be successful with a dull, ugly, or buggy website, so design with care. It is absolutely critical that you choose a web design team that will check the efficiency and design of your website on different browsers and devices. For example, if you design your website using Google Chrome, you’ll want to test and make sure that it runs equally smoothly on Firefox, Safari, and, yes, even Internet Explorer. You may even want to test it out on different devices—a tablet, a laptop, a desktop—to make sure that all of your visitors are getting the same experience across the board. When looking at companies to design your church website, make sure to ask if they will compare the end result in different browsers. Not every website needs an app. And not every website needs a separate mobile version of their website either—the days of a distinct and different “mobile version” of a website have passed, and many of these types of websites have a way of looking dated on today’s platforms. However, that does not mean that you should negate your mobile and smartphone presence. It is absolutely necessary that your website be optimized and viewable from a smartphone or mobile profile. Most of today’s web surfers expect to be able to access any website from their phones, and yours should be no exception. Mobile friendly websites became even more important on April, 21st 2015 when Google rolled out it’s mobile friendly update. Basically if your church’s website is not mobile friendly it’ll be penalized in google search results. Not sure if your site is mobile friendly? Here’s a simple tool you can use to test the mobile friendliness of your website. Demonstrate that you are not only a church among yourselves, but a vital, thriving part of your community as a whole, and a great source of information and community outreach. You might be surprised to find yourself as a hub of activity and charity by those who might not have known everything you do. We can certainly help with that Russ.